A NEW STUDY ON THE GROWING DEMOGRAPHIC COHORT OF PANKS, OR PROFESSIONAL AUNTS NO KIDS, REVEALS A SIZABLE TRIBE OF CHILD-LOVING, AFFLUENT WOMEN WITHOUT CHILDREN OF THEIR OWN - BY CIRCUMSTANCE, CHOICE OR CHALLENGE. Melanie Notkin, the founder of SAVVY AUNTIE - A Celebration of Modern Aunthood - uncovered and coined the term PANK in 2008. In 2018, she partnered with Michael De Cicco, a strategic market researcher for global iconic brands, to take a deeper look at PANKs to better understand the cohort – not only from a demographic standpoint (inclusive of relationship, fertility and children in their lives) but also their specific needs, behaviors, spend and preferences across a range of categories. There are 18.4 million PANKs ages 20-50 in the United States - more than a quarter (28%) of all American women in that age group. Our survey found that overall, 4-in-5 PANKs are ages 33-52, and half are ages 38-47. This generation of PANKs wield enormous social and economic influence. And yet, while PANKs represent huge opportunity, this hidden demographic often remains overlooked, misunderstood and unappreciated by marketers and society-at-large. 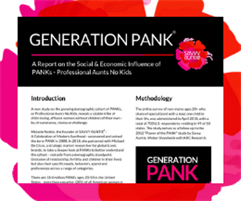 In the first of a series of reports derived from selections of the survey, GENERATION PANK focuses on the strong bonds between Aunts by Relation and/or Aunts by Choice and the children in their life as well as the social and economic influence of PANKs at the holiday season and all year-round.